Here we go again: just like we did with Ubuntu 10.04, we'll be providing news regarding important changes in Ubuntu 10.10 Maverick Meerkat as soon as they are released. A very useful feature, especially if you install a package that breaks things - having a history of recently installed software can be used to identify the faulty package and remove it. 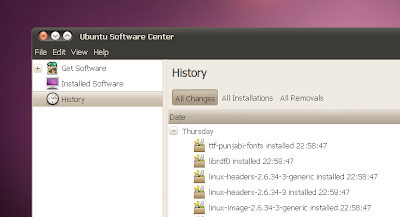 This new version of Ubuntu Software Center also brings animations for pathbar elements and many other changes which you can see HERE.